Tudor Markets will bring stalls back to Stourbridge from March, and aim to give the ‘best experience’ for shoppers. A Christmas Market is also planned for next month. The firm also runs Dudley Market. 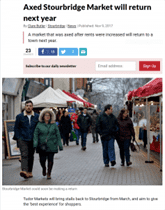 The market was shut in September after former managers LSD said they could not continue to run it following a change in policy – which they said amounted to a 850 per cent rise in rent – by Dudley Council.